Holbeach United celebrate a goal. Leaders, and title favourites, Peterborough Sports host second-placed Newport Pagnell in the top game in the city over the weekend. Action fron Yaxley 7, Eynesbury 0 in the FA Vase last weekend. Photo: David Lowndes. Sports returned to the top of the table with a hard-fought 1-0 win at Sleaford on Wednesday (September 14) courtesy of a Mark Jones goal. Sports have won six of their seven Premier Division games this season. Pagnell have won fibe of eight. Sports are currently a point clear at the top, but third-placed Holbeach are just two points behind with a game in hand. Holbeach are one of two top-flight teams (Sileby Ranagers are the others) to have avoided a Premier Division defeat this season. The Tigers beat Huntingdon 5-4 in a humdinger of a contest on Wednesday. They host lowly Oadby at Carter’s Park tomorrow. 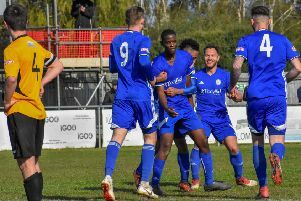 Yaxley will try and end Sileby’s unbeaten record tomorrow, when mid-table Peterborough Northern Star attempt to complete a quick double over Leicester Nirvana. Star are away from home. Whittlesey Athletic are the best-placed local team in Division One. They are 11th and take on the team just above them, Potton United, at Feldale Field tomorrow. Second Round Qualifying: Gresley v Stamford. Premier Division: Eynesbury Rovers v Deeping Rangers, Harborough Town v Wisbech Town, Holbeach United v Oadby Town, Leicester Nirvana v Peterborough Northern Star, Northampton Sileby Rangers v Yaxley, Peterborough Sports v Newport Pagnell Town, Huntingdon Town v Bugbrooke St Michaels. Division One: Bourne Town v Raunds Town, Irchester United v Blackstones, Whittlesey Athletic v Potton United. League Cup: Huntingdon Town v Bugbrooke St Michaels. Division One South: March Town United v Needham Market Res, Wisbech St Mary v Whitton United.